Fly through the air on this cute video slot into a virtual native American village where you must spin the totem polls and match up bonus wilds and rare symbols to earn yourself a huge range of prizes and cash rewards. This is a hugely affable online 5 reel and also features chirping desert crickets that will cheer you on to victory. Thunderkick have been creating unique high-end products for the busy online slot game market for more than five years, with effort and soul woven into all of their innovative titles. Their team combine years of experience in game design and development, and they pride themselves on creating an immersive atmosphere for their fans, with vivid graphics and engaging sound effects combining to create emotionally involving games. With just the 11 paylines, Turning Totems may not sound like the greatest place to gain the grandest wins – but Thunderkick have built some seriously innovative fun into this Native-American themed online slot game. Hosted by a quirky, endearing little Native-American Chieftain, whose magic staff helps to spin the reels. From £0.20 to £100.00, we can find out what’s on offer in this original way to play online. Set in a dry, sun-bleached canyon, where only the natives and a host of cacti and ancient buffalo skulls reside, there are five mystical totems; each one comprised of three interchangeable carved and painted lively symbols, beneath a fourth, sleeping wooden owl. There are seven symbols in total, plus a bonus Thundersnake. Most of the symbols are painted; vibrant Golds, Oranges, Pinks, Greens and Blues; while another, that of an eagle with its eyes closed, is merely carved out of wood. However, this is actually a Sleeping Wild, and when it lands on the same reel as a Thunder Snake, the entire reel will become a Thunder Reel, and grant an instant Respin – as well as activating the Sleeping Wilds and enhancing the chances of winning lines on either side. Landning three Thunder Reels at once will trigger five Free Spins – during which the Thunder Reels will remain active until the end of the bonus. With the likelihood of sizeable wins coming from the above bonus, this game can quickly turn from totem-spinning fun, into money-spinning excitement. The sound effects and detailed, 3D cartoonish visuals make for a pleasant environment to play in, and the game does offer a nice, relaxed feel to its busy reels. It’s an uncomplicated game, and creates some seriously good fun in a laid-back environment, which Thunderkick have been meticulous in creating – looking out for the Sleeping Wilds coming alive is particularly exciting! With sweeping clouds moving across the sky in the background, and the little totem faces and Chieftain host looking pleasantly back at us from the reels, Turning Totems provides an inviting atmosphere for gamers looking for something simultaneously different, and rewarding. 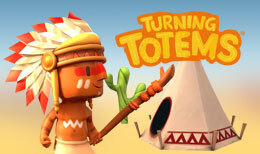 Turning Totems is a cool, different way to play online, and a delightfully constructed concept delivered by Thunderkick. With so much effort put into creating genuine gaming atmospheres, they have succeeded again. Although the low number of symbols and paylines mean that there are fewer bonuses, this does not equate to fewer ways to win. Spinning the totems is a fun, and rewarding experience, and well worth a 9/10 for innovation from Dream Jackpot.